If you’re searching for low back pain relief as a result of a lumbar disc herniation, you are not alone. Take a look at these stats from www.chiro-trust.org. Between 2004 and 2008 an estimated 2.06 million episodes of LBP occurred in the United States (US) alone! Each year, LBP accounts for 3.15% of all emergency visits with 65% of LB injuries occurring at home. According to estimates, two-thirds of all Americans will experience at least one episode of back pain during their lifetime. Interestingly, according to one study, LBP peaks two times during life: between 25-29 years of age and 95-99 years of age, regardless of cause. Looking at gender differences, when analyzed by five year age groups, males aged 10-49 and females aged 65-94 had a greater risk for LBP when compared with the opposite gender. Now that we know what causes a lumbar disc to herniate, how do we find treatment? It is best to seek natural, alternative methods before resorting to risky and dangerous surgeries to repair the disc or fuse the segment with metal plating. The human body is an amazing work of art that will try to heal itself when given the proper healing environment. The only healthcare profession that directly affects the healing of the spine and nervous system naturally is chiropractic care. 2. Examination including orthopedic, neurological, functional, and palpation of the spine. 3. Chiropractic adjustments to areas in the spine that are mis-aligned or lacking normal movement and function. Natural treatments that can be used in conjunction with chiropractic care are massage therapy, acupuncture, and exercise (physical therapy). 1. Pain relieving prescription drugs, muscle relaxing prescription drugs, sleep aids for patients with trouble sleeping due to pain levels. Many non-natural treatments are risky and not guaranteed to relieve your pain or symptoms. However, some lumbar disc herniations are medical emergencies and should be treated with such non-natural treatments. According to spine-health.com any patient who has progressive neurological deficits, or develops the sudden onset of bowel or bladder dysfunction, should have an immediate surgical evaluation as these conditions may represent a surgical emergency. 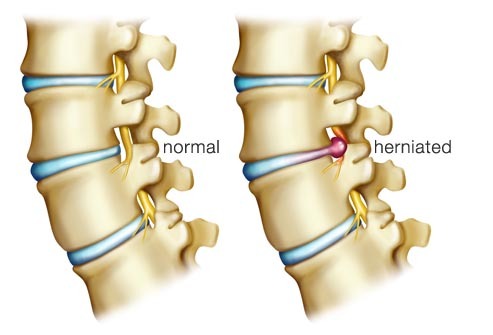 Fortunately, both of these conditions are very rare, and most surgery for a lumbar herniated disc is an elective procedure. At Zionsville Chiropractic and Rehabilitation we provide natural lumbar disc herniation treatment in Indianapolis. We provide short-term relief care of pain and symptoms then release the patient. We do not provide long-term treatment plans. We are all about the patient and getting them back to doing the things their pain has taken from them as quickly and conveniently as possible. Call us or walk-in and be seen today, we offer no obligation complimentary consolations.